It’s always easy to have armchair discussions about what the government should do and what it isn’t doing. Notwithstanding that, here are a few things we’d love to suggest to the tourism ministry, because we can’t help but say again and again that India can make a lot of money off its tourism wealth but it we are simply letting opportunities slip from our hands. One of the biggest charms of Indian tourism is its architecture and wealth of historic monuments. And there’s a long list of heritage monuments that are still sitting in squalid environments. An effective solution for this would be to outsource the maintenance and exterior lighting of the heritage monument to corporate giants in return for some branding opportunity at the monument. Many think this is outright commercialisation. But this is a much better option than leaving it an abandoned state and let it decay. If you closely notice, many tourist destinations around the world are merely made up of created experiences. Be it botanical gardens, architectural monuments, backwaters, the Himalayas, the tourism ministry should see the potential of a place to attract tourists rather than merely banking on the natural beauty of a place. The tourism industry which includes the government and private players, need to manipulate destinations as experiences and not sightseeing point alone. For instance, steps can be taken to make the tour replete with tour guides, activities for the children, culinary tours, interactivity for the tourist with the culture of the place etc. It would completely wrong on anyone’s part to simply say ‘Create better infrastructure’. This is a very generic statement. But it is critical to build good roads and approach points to a certain tourist destination. For foreign and domestic tourists alike, a bumpy ride with potholes and a punctured tire only to reach an exotic Indian destination is no good. Packaged train travel, easy bus connections and safe car hire services with knowledgeable personnel combines with great freeways and highways may sound utopian but are critical features for an unmatched tourist experience. Many people seem to be having a problem with exoticizing India to the West but at some point if that strategy allows for the raking in of moolah, then why not? We’re not promoting India as the land of snakes and charmers anymore, but the tourism ministry should surely pursue aggressive online and other marketing strategies to promote India as a must-visit location. Whether it is broadcasting ‘Incredible India’ campaigns abroad, holding tourism seminars or offering Indian locations with facilities to promote foreign film productions in the country. Aggressive marketing is absolutely critical to be seen and heard well. India is currently in a position where it can make a cash cow out of selling customized experiences, luxury spa sessions, rare animal sanctuaries, religious pilgrimage tours and extreme Himalaya tours. With too many points of differentiation available, Indian tourism should focus on how it has something on offer for everyone in every category with all budgets. 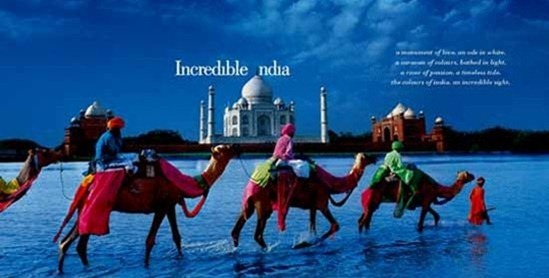 India on shoestring, India in luxury, the royal India, urban India, the common man’s India, historical India and much more. The way information is packaged and distributed can go a long way in improving tourist traffic in the country. Although the government has already started making a lot of improvements in this area, we still have a long way to go to let tourism alone generate significant revenue for the country. We need to capitalize on India as a destination where the royal Bengal tiger, a common labourer, a few millionaires, religious dichotomies, exotic culinary treasures and some of the most expensive spas of the world co-exist. Now, that’s quite a challenge, isn’t it? Do you have any pointers to add? "5 things Government needs do to promote the Tourism Industry in India", 5 out of 5 based on 1 ratings. Only 22% of Indian Govt’s content removal requests complied by Google! India Shining: this time with Aplomb! It has helped in completing my article. Thanks a lot. It is really a great article to our tourism industry. Promote tourism industry means protect our nature. You’re so awesome! I don’t suppose I’ve read through anything like that before. In India online car and taxi booking services is growing up day by day and we are focusing up to how we can providing best services to our customer so that the tourists enjoy the trip i.e. Agra, Jaipur and etc. The point that you have mentioned about looting foreigners(specially cab & auto drivers) is completely correct, & most of them are intentional. It’s because whenever they find someone from abroad(specially whites), one thing that comes to their mind is “America, Rich people, $$$”. I suggest you to pay them strictly as per METER readings(even if they argue unnecessarily). As far as shopkeepers are concerned, please ask the other customers about the prices of products, although this is not the right procedure. On the other hand, if you buy any Factory made products like Cans, Food, Clothes, Shoes.etc, pay them strictly as per MRP(Maximum Retail Price) in INR printed. Better buy from Shopping malls, but they are less in numbers in the interior rural areas. Please download the pdfs in the link http://www.nationalconsumerhelpline.in/consumer-tips.aspx. These will help you. Please note that there is an organization named ‘Consumer Forum’ in India. You can lodge a complaint anytime you want, actions will be taken. Contact numbers & Websites are mentioned below. I address to all the foreigners across the globe to come to our country & enjoy your holidays, because we have Snow caps, Mountains, Desert, Beaches, Ancient Monuments & heritages, Wild life Adventures, Megacities.etc. Apart from that India has 16 official languages(including English), every states have different cultures (like Lifestyle, Clothing, Traditional fashions, Fooding, Architectures.etc.). So please don’t hesitate to visit next time. Consumer Complaint Toll-Free Call: 1800 11 4000 from anywhere in India. nemesh and arun,i agree,security is right point but the best tourist destination of tourists go there,where will be god and attractive tourist place and best tourism infrastructure and tourism features and special focus of the first to have all these things to attract tourists. As a videshi who has spent quite a few years in India over the past few decades, I’d like to mention one thing that I feel really puts foreign visitors off, and that is the government-promoted attitude that we should pay much more for everything. Discriminatory pricing doesn’t create a good feeling in the heart and it doesn’t make people feel welcome when they are expected to pay up to 50x more than Indian tourists, which is the case at the Taj Mahal! It’s a short-sighted policy that in the long run hampers tourism. Whether it’s intentional or not, it actively promotes the idea that taxi and autorickshaw drivers and merchants are justified in charging whatever they can get away with. This needs to change. It’s really counterproductive. Indian hospitality is famous around the world, but this is something that conveys a very inhospitable attitude and it does nothing to attract more visitors. I'll appreciate your research work.. Thank you giving your experts advice..<a href="http://www.capitalstars.com">Stock Tips</a>. and what about extra initiatives, especially in terms of security for solo female travelers? All the above points need attention. I would like to comment first on promoting tourism as an experiance. It is absolutely neccessary. If you think from inside out, you will only know what you have. If you look at the tourism from global view, we can understand what is the real meaning of promoting tourism as an experiance. Take the case of Thailand. They promote the country as a destination for entertainment (you know what I mean). In addition, there is nature, traditional Thai boxing rings, annual International Flower exhibitions in Chang Mai, etc. But at the base, entertainment is the main theme. If you take Europe, its Castles, Wine, Bull fights. If you take Las Vegas, its gambling, If you take New Orleans, its music, etc. But in India we promote Taj Mahal seperately, Charminar seperately, Jaisalmer seperately, Gods own country seperately, Bangalore seperately. There is no central theme. Now coming to Roads, its true that we need good roads. But slowly the quality of our roads is improving on a macro level. With many expressways, the situation is far different than even 10 years ago. However roads is not the only thing that troubles the tourists. The whole infrastructure has to improve. Infrastructure from tourism point of view encompasses, roads, hotels, food, positive locals, multiple choices of journey from point a to point b, communications, exchange of forign currency to rupees, medical facilities in case of urgency etc. With only improvement in roads, forigners dont get the complete experiance. Out of all these only our communication is the world class. We get internet / ISD facilities in even small hamlets too. Now coming to agressive promotion, the only point I can think of at this moment is the crash of rupee. Though it is bad for the economy as a whole, we can promote it as a reward to those who are undecided on where to go. What about security? We have clients coming from other countries and it is a nightmare for us to take them to Indian Places. I think the first step to tourism promotion would be to make India secure for Foreigners. Improve traffic sense so at least they can cross the roads.